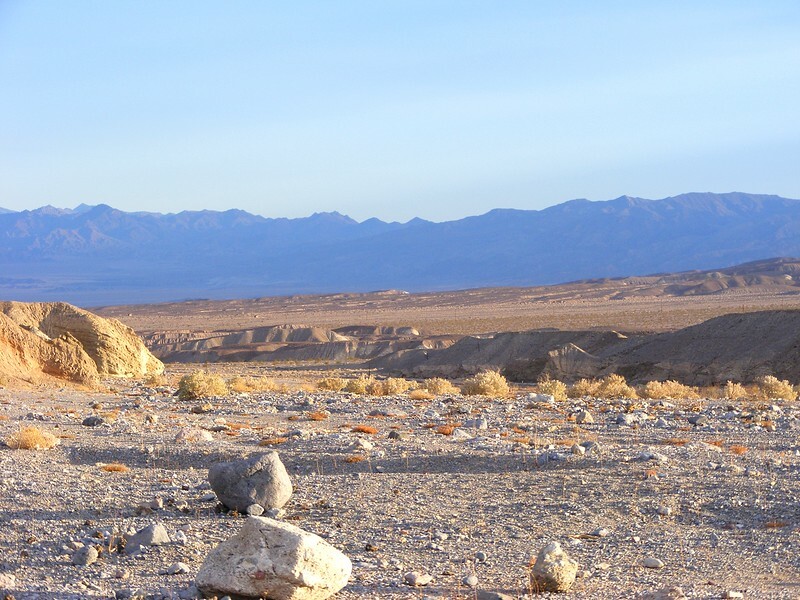 Although off-the-beaten-path travel usually leads to amazing experiences, the thought of spending time in a place called Death Valley could scare off even the stealthiest of traveler. Thankfully, today’s guest contibutor, Vanessa Chiasson, is showing us that the hottest and driest national park in the US isn’t as inhospitable as its name would suggest. 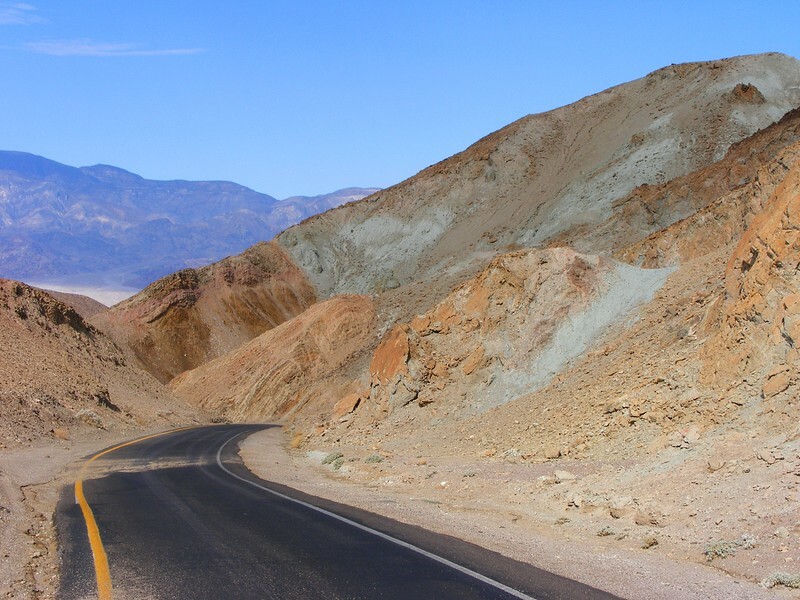 Most travelers love to visit a warm weather destination, but not everyone is eager to embrace the kind of heat that radiates from Death Valley National Park. 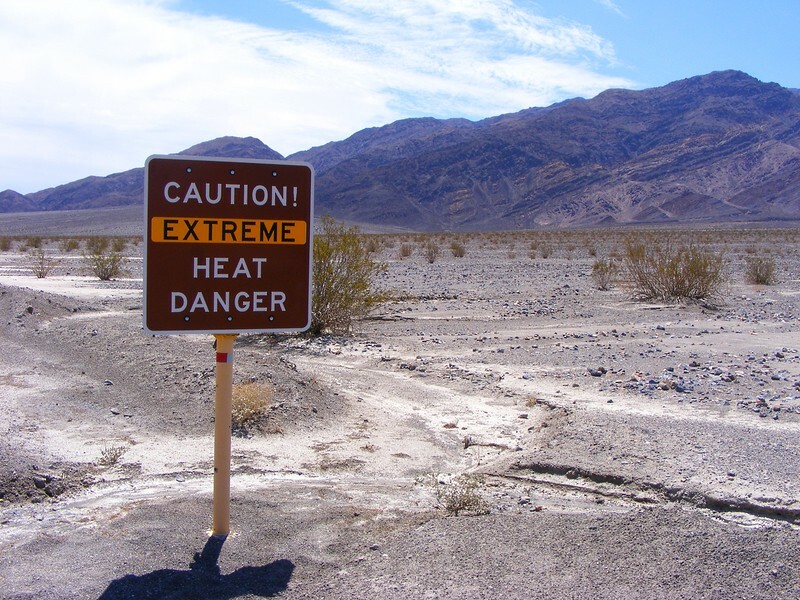 The park motto is “Hottest, Driest, Lowest” and Death Valley delivers! It offers a scorching hot, scintillating travel experience. Often overshadowed by famous neighbors like the Grand Canyon, Los Angeles, and Las Vegas, Death Valley sees far fewer visitors than other National Parks of the southwest and many travelers have no idea that they’re missing out on an exceptional beauty that simply must be seen to be believed. The desolate terrain gives this park its unique appeal. It’s easy to assume that there’s no life in Death Valley. At first glance, the park looks desolate, nothing but dusty red rocks. But this dry, bleak valley is actually home to some pretty wild wildlife. Coyotes call the park home, as do their arch enemy the roadrunner (No word on which creature ultimately triumphs but I can report that roadrunners are as optimistic as any bird when it comes to hanging outside cafes, looking for a spare crumb!) Tiny pupfish thrive in salty streams – the only place on earth that they call home – and bighorn sheep claim the cooler mountains as their turf. Over 1,000 plants thrive in Death Valley and, if you are so lucky to visit after a rare rainstorm, you’ll be rewarded with one of the most beautiful wildflower displays in the world. Dusty red hills surround the roads. The wildflower displays are rarer than I’d like but you don’t have to wait for their exceptional blooms in order to see that there are more colors in Death Valley beyond rusty read. Intrepid explorers can find turquoise, lavender, vermillion, and shades of silver, and even gold in the cliff faces – just not the kind of gold that drove early explorers to the area! The scenic route of the Artist’s Drive showcases a riot of color, while an early morning sunrise at Zabriskie Point brings more subtle shades of lemon, coral, peach, and salmon. My personal favourite, Mustard Canyon, lives up to its name and explorers are swallowed up in shades of yellow, sienna, and gold. 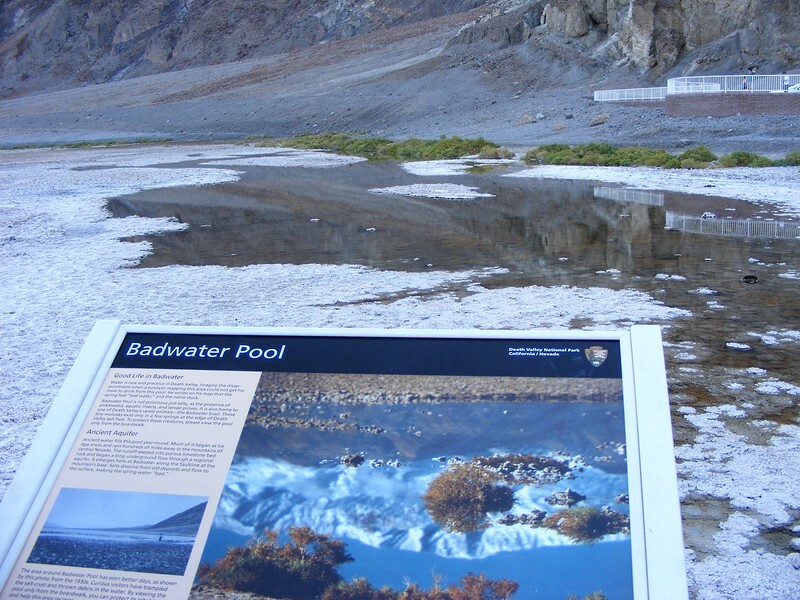 Badwater Basin is the largest protected salt flat in the world. There’s one other color that really stands out in Death Valley: white, snow white, as far as the eyes can see. At 200 square miles, Badwater Basin is the largest protected salt flat in the world but I promise you won’t be thinking minerals when you see it. Instead, it looks like an endless expanse of white, fluffy snow! It’s cooler here, at the lowest elevation in North America, and the air is refreshing. But take heed when you head out to explore – distances are deceiving. “Take Heed” should be the park’s second motto. Exploring the many wonders does take some advanced planning. This is not the place for a spontaneous hike or a last minute off road adventure. Do not pass go until you check in at the Rangers’ station. You can learn about the many programs they offer and, more importantly, you can learn if there are any roads closed, any recent rock slides, and you can discuss your proposed driving and hiking routes. The weather alone isn’t the only obstacle you’ll encounter. The landscape itself is guaranteed to throw a few challenges your way. The natural rock formations, such as those found at the cheekily named Devil’s Golf Course, are fascinating to explore but can deliver a nasty scrape should you stumble. Long, loose layers are best for sun and skin protection here! The stunning formations also severely limit cell reception – all the more reason to check in with the friendly Rangers to discuss your plans for the day. Always pack appropriate travel gear when exploring National Parks! 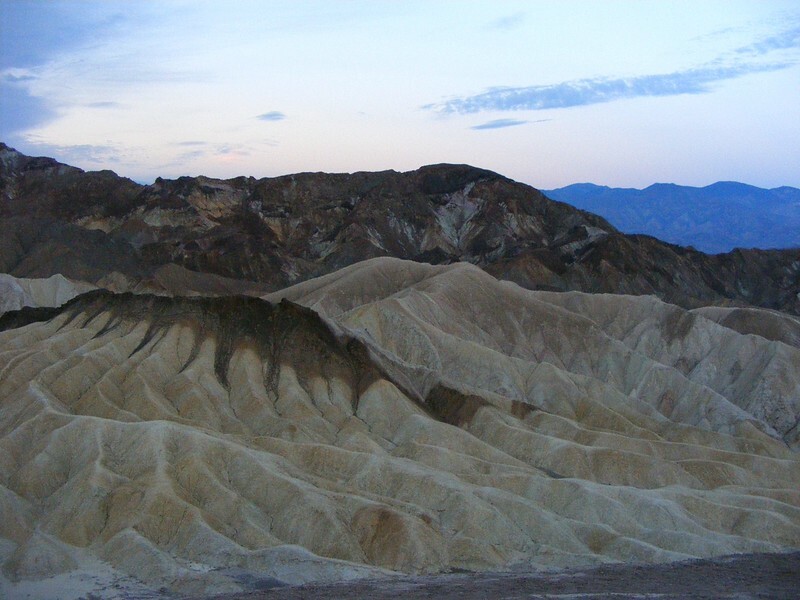 If you visit Death Valley in July like we did, a simple nature walk will count as an extreme sport. It’s not sufficient to simply pack a bottle of water. The extreme dry heat makes it difficult to gauge how much moisture you’re losing from the sweat that instantly evaporates off your body. We kept a Styrofoam cooler of ice (both easily found at local pharmacies or general stores) packed with a week’s worth of sports drinks and water, along with generous rations of dried snacks. All this for just for a two day trip in an air conditioned SUV! Whenever we left our vehicle, we were loaded down with fluids and always sporting sun hats. At Death Valley, it’s be prepared or be in trouble. The extreme heat was a major consideration in our accommodation selection. While the small towns around the park boundaries offer inexpensive motels, we opted to stay at the Furnace Creek Ranch. These comfortable cabin-style accommodations were the perfect air conditioned home base for quick rest stops throughout our daily excursions. I’m especially glad we chose the cabins over the more traditional hotel rooms, as the cabins were surrounded by beautiful and fragrant salt cedar trees and it was such a peaceful environment. A natural spring feeds the ranch’s swimming pool (guaranteed to be the most refreshing dip you’ll ever have!) as well as the adjacent Furnace Creek golf course. Yes, a few maniacs can be found golfing here in July. My husband was one of them! The secret to a successful round is to get up early to beat the heat – we’re talking 5:00am here – and to gracefully accept that you’re not going to chase down any wayward balls. If the coyotes don’t beat you to them, the heat will punish you in your pursuit. Need help planning your next National Park Adventure? Check out our some of our travel tips in our National Parks Travel Planning Resources page! We were pleasantly surprised with the food options within in the park and, given that one service provider has a monopoly and that the park is so isolated, we found prices to be quite reasonable. Some of our personal favourites include homemade onion rings and pizza at the Corkscrew Saloon, prickly pear margaritas at the 49ers Café, and fresh, local dates and date bread at the gift shop. Visiting National Parks is a priority for me when I travel. I love the opportunity to explore unique natural and historic sites that might not otherwise be protected and I’ve never been disappointed by the fun and informative sessions offered by the Rangers. And Death Valley remains my favourite park by far. There’s just something about it that has captured my heart and I can’t help but admire the endearing determination of animals and plants that thrive here and the people who help protect them. Have you ever been to Death Valley? Join the conversation at the My Itchy Travel Feet page on Facebook or send us an email to ask a question or share your experience.